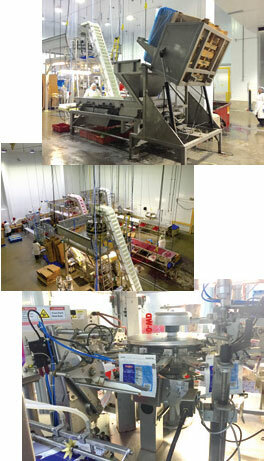 BC Frozen Foods Ltd. utilizes a cutting edge facility that allows us to service world class customers. Our state of the art manufacturing capabilities and high quality standards, are a benchmark for our industry. Equipment used is best in class to enhance and ensure the manufacture of the highest quality products. From our Oxbo Combines to our Yamato scales and Triagle Baggers, to our Safeline Detection systems, we partner with only the best. Comprehensive maintenance of equipment and facilities is conducted routinely as a prerequisite use of our quality assurance system. The facility is composed of two buildings that in total cover 85,000 square feet. Every detail of our facility, from the layout of our warehouses, to our LED lighting system were designed with food safety and efficiency as our top priority. The processing plant is dedicated to receiving and processing fruits and vegetables. Our IQF tunnel operates 24 hours a day from June to October to ensure our products are frozen immediately upon receipt. Our onsite computer controlled 25,000 square feet of cold storage ensures adequate space for bulk storage and day to day operations of our repack plant. Our repack facility is dedicated to the packaging of frozen fruits and vegetables. The repack area is temperature controlled to ensure our products remain in their optimal frozen state during the packing process. All lines include visual inspection, magnets, and metal detectors to ensure the safest products. Our equipment is best in class and operated by experienced personnel to ensure optimal efficiency. To ensure product and packaging continuously exceed our customer’s expectations.